“Jabberwocky” by Lewis Carroll was originally published in the 1871 novel “Through the Looking-Glass, and What Alice Found There”. Let’s take a gander at a summary of this nonsense poem and then discuss it through a line-by-line analysis. 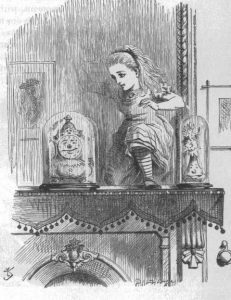 In the book “Through the Looking-Glass, and What Alice Found There”, Alice finds a book in an unintelligible language. She then realizes that the world she is in is in reverse, so she holds the book up to a mirror. This poem is what the mirrored version. However, she still finds the poem bewildering since many of the words don’t make any sense. Fortunately, Humpty Dumpty explains some of the poem as does Carroll’s notes and personal commentary. Essentially, at 4:00 P.M. smooth and active badgers were boring holes in the hill-side while unhappy parrots and turtles were squeaking. The rest of the poem isn’t explained by Humpty Dumpty nor Carroll. However, it is a warning about the Jabberwock, Jubjub bird, and Bandersnatch. But as the boy rested on the tum-tum tree, a Jabberwock came and he killed it. The writer was happy about the Jabberwock’s death, but nothing changed in the place and it continued on as before. Format: Seven stanzas with four lines each (quatrains) written in iambic feet. Gyre: to go around like a gyroscope. Gimble: to make holes like a gimlet. Wabe: the side of a hill. Mimsy: ‘flimsy and miserable’. Borogoves: an extinct kind of Parrot. Mome: home. Raths: a species of land turtle. Outgrabe: something between bellowing and whistling, with a kind of sneeze in the middle. Uffish: voice is gruffish, the manner roughish, and the temper huffish. Burbled: ‘bleat’, ‘murmur’, and ‘warble’. Snicker-snack: related to the sword called snickersnee. Frabjous: fair, fabulous, and joyous. Callooh! Callay! : Words to express happiness.